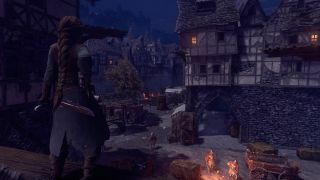 Frozenbyte has announced that its new project, the stealth/assassination/babysitting game Shadwen, will be out in May. The studio also put out a “release announcement trailer” that shows off some lovely, and occasionally brutal, gameplay that faintly echoes its previous series, Trine. The level of violence is maybe a bit unexpected (although Frozenbyte's pre-Trine Shadowgrounds games weren't exactly wall-to-wall hugfests), but what I think is far more interesting is the subtle emphasis on the relationship between Shadwen, the assassin, and Lily, the young orphan she meets on her way to kill the King. It appears as though Lily will prove useful in some situations, but the trust between the two is delicate, and seeing too much bloodshed could leave it broken. It's not available for pre-purchase yet, but Frozenbyte tweeted at the end of February that it “looks like” the launch price is going to be $14.55. That figure was determined by an unusual pricing contest in February that was built around a limited-release demo: As the community score went up during the demo period, the launch price went down. You can find out more about the game at shadwen.com.